Carman’s has welcomed a new flavour to its family. 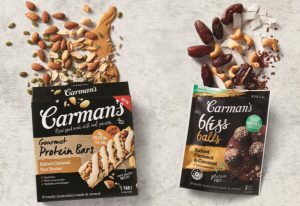 Salted caramel, the flavour of the moment is the star of Carman’s new creations. Salted Caramel Nut Butter Protein Bars are a fruit free, gourmet protein nut bars. Each bar has 10gram of protein and are also gluten-free, featuring a drizzle of peanut butter across the top. Each bar has less than 7grams of sugar. Salted Caramel & Coconut Bliss Balls are 100% natural and are made of wholesome ingredients and naturally sweetened with dates, they’re an energy pick-me-up. Both creations are now available at Woolworths, Coles. and select independents.